"Enjoy your food, but eat less." That simple message may be the main point in the 2010 Dietary Guidelines for Americans, which were released on January 31, 2011. Oh, there are some specifics about less sodium and more vitamin D and potassium. But this year's guidelines, moreso than any previous edition, fully acknowledge that the No. 1 health crisis confronting this country is not cancer, heart disease or high blood pressure, but obesity … which can lead to those diseases and many others. "The overarching theme this year was to tackle obesity," said Roger Clemens, professor at University of Southern California and a member of the 2010 Dietary Guidelines Advisory Committee. That committee drafted suggestions that became the basis for the official guidelines created jointly by USDA and the Dept. of Health and Human Services. "Because more than one-third of children and more than two-thirds of adults in the U.S. are overweight or obese, the seventh edition of Dietary Guidelines for Americans places stronger emphasis on reducing calorie consumption and increasing physical activity," said an announcement accompanying the guidelines. The guidelines contained no major deviations from the draft released by the Dietary Guidelines Advisory Committee last June committee. But the final report did seem to water down the recommendation on sodium. The committee recommended for everyone "a gradual reduction in sodium," from the current 2,300mg per day to 1,500mg. The final guidelines leave it at 2,300mg per day except for various segments of the population – which, the final report notes, "applies to about half of the U.S. population." Chapter 2: Balancing calories to manage weight -- Explains the concept of calorie balance, describes some of the environmental factors that have contributed to the current epidemic of overweight and obesity, and discusses diet and physical activity principles that can be used to help Americans achieve calorie balance. 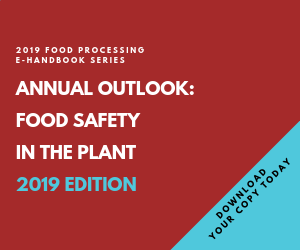 Chapter 3: Foods and food components to reduce – This is the one for food processors (and ingredient suppliers) to key on. It focuses on several dietary components that Americans generally consume in excess, compared to recommendations. These include sodium, solid fats (major sources of saturated fats and trans fats), cholesterol, added sugars, refined grains and, for some Americans, alcohol. (More on those later.) The chapter explains that reducing foods and beverages that contain relatively high amounts of these dietary components and replacing them with foods and beverages that provide substantial amounts of nutrients and relatively few calories would improve the health of Americans. Chapter 4: Foods and nutrients to increase – Another bullet point for processors, this one focuses on the nutritious foods that are recommended for nutrient adequacy, disease prevention and overall good health. Those include vegetables; fruits; whole grains; fat-free or low-fat milk and dairy products; protein foods, including seafood, lean meat and poultry, eggs, beans and peas, soy products, and unsalted nuts and seeds; and some oils. It also notes nutrients that are under-consumed including potassium, dietary fiber, calcium and vitamin D.
Chapter 5: Building healthy eating patterns -- Shows how the recommendations and principles described can be combined into a healthy overall eating pattern. The existing USDA Food Patterns and DASH Eating Plan are healthy eating patterns that provide flexible templates allowing all Americans to stay within their calorie limits, meet their nutrient needs and reduce chronic disease risk. Chapter 6: Helping Americans make healthy choices -- Discusses two critically important facts. The first is that the current food and physical activity environment is influential in the nutrition and activity choices that people make — for better and for worse. The second is that all elements of society, including individuals and families, communities, business and industry and various levels of government, have a role to play in the movement to make America healthy. The chapter suggests a number of ways that these players can work together to improve the nation's nutrition and physical activity. Reduce daily sodium intake to less than 2,300mg for most healthy people and to 1,500mg for people who are 51 and older, are African American or have hypertension, diabetes or chronic kidney disease. "The 1,500mg recommendation applies to about half of the U.S. population, including children, and the majority of adults," the document notes. Consume less than 300mg per day of dietary cholesterol. If alcohol is consumed, it should be consumed in moderation — up to one drink per day for women and two drinks per day for men. Increase vegetable and fruit intake … especially dark-green and red and orange vegetables and beans and peas. Consume at least half of all grains as whole grains. Increase whole-grain intake by replacing refined grains with whole grains, not just by eating more whole grains. Drink or eat more fat-free or low-fat milk and milk products. Choose a variety of protein foods, which include seafood, lean meat and poultry, eggs, beans and peas, soy products and unsalted nuts and seeds. Choose foods that provide more potassium, dietary fiber, calcium, and vitamin D, which are nutrients of concern in American diets. And for specific groups: In addition to recommendations for pregnant women, it suggests that everyone over 50 "consume foods fortified with vitamin B12, such as fortified cereals, or dietary supplements." And that's probably the only mention of supplements. Agriculture Secretary Tom Vilsack and HHS Secretary Kathleen Sebelius announced the 2010 Dietary Guidelines on Jan. 31. The Congressional mandate for the guidelines was the end of last year, and a spokesman for USDA said the two agencies actually made the deadline. "The Dietary Guidelines policy document was finalized and signed-off by Secretaries Vilsack and Sebelius in December 2010. Release of Guidelines to the public was based on selecting a time when both secretaries were available and a time when we could ensure that the DGA would not be lost in the holiday rush but would get the greatest press pick-up in time for New Year's resolutions, etc.," the spokesman told us. "The 2010 Dietary Guidelines are being released at a time when the majority of adults and one in three children is overweight or obese, and this is a crisis that we can no longer ignore," said Vilsack. "The bottom line is that most Americans need to trim our waistlines to reduce the risk of developing diet-related chronic disease. Improving our eating habits is not only good for every individual and family, but also for our country." In all, there were 23 "key recommendations" for the general population and six additional ones for specific population groups, such as women who are pregnant. Consumer-friendly advice and marketing tools, including a next-generation Food Pyramid, will be released by USDA and HHS in the coming months. As we said, with only a little deviation on sodium, the final document varied little from the recommendations made by the advisory committee last June. The committee, composed of 13 nutrition experts, spent the previous year reviewing the most recent scientific research on diet and health and listening to public (and industry) comments. Even the draft was no surprise. As a result, most food & beverage processors already had reformulation projects under way before either report. For example, Kraft will reduce the sodium across its product line by an average of 10 percent by 2012, said Richard Black, vice president of global nutrition at Kraft Foods Inc., in an IFT webcast on the subject last month. "Because we have thousands of products, it will take time to work through them all," he said. "A food company cannot look at all foods in the diet, and so should be concerned with removing the maximum amount of sodium possible from the foods they make, which means prioritizing efforts to achieve the greatest reductions across a unique portfolio of foods," he said. "Food processors are looking to ingredient suppliers to collaborate in customizing solutions that meet their sodium reduction targets while also meeting taste satisfaction requirements," says John Franklin, marketing manager for Cargill Salt, which markets both salts and sodium replacers. "Cargill has solutions that allow customers to deliver great-tasting products with up to 50 percent less sodium." Wheat Thins will go from 11g of whole grains to 22g. Honey Maid Graham Crackers from 5g to 20g. Triscuit already is 100 percent whole grain. "And we believe they taste as good, but they are or will be different," he said. "The eating behavior stays the same; the product changes for the consumer. We are fundamentally changing the way [consumers] shop for foods, prepare foods and eat foods." The Healthy Weight Commitment Foundation, of which Kraft was one of 16 founding members, has pledged to collectively cut 1 trillion calories from food products by the end of 2012 and to ratchet that up to 1.5 trillion calories eliminated by the end of 2015. The Dietary Guidelines final report "is based on the advisory committee's report and a consideration of public and federal agency comments," the report notes. The guidelines form the basis of nutrition education programs, federal nutrition assistance programs, such as school meals and Meals on Wheels programs for seniors, and dietary advice provided by health professionals. Their effect on the overall American diet is slow, but past editions emphasized fiber, whole grains and fruits and vegetables and the elimination or reduction of trans fats and saturated fats. Eventually the average shopper caught on.